Other than Porsche dealers what are some other good part suppliers in the US? ALSO: I just purchased this 944 and the owners manual is missing....wondering if anyone can scan the pages in the owners manuals that describes each button, dial, etc. on the dash and center console? Porsche Genuine Parts Catalogue (from PET) - online PDF versions for all cars from 356 to current, remanufactured parts, manuals, and Tequipment. Go to Great Britain/Workshop Information/Genuine Parts. Or, go to USA/Workshop Information/Genuine Parts etc., etc. The Retail Parts Price Search feature (for our Contributing Members) has been updated to reflect December 2014 retail pricing for the US. We try to update this on a monthly basis as the price lists come available to us. December 2014 the parts price list supports: US: 381,586 parts. That is almost 40,000 more part numbers than the February price list - must be all the new models.... Thanks again to Contributing Member Porschelibrarian for his help in obtaining this list! The Retail Parts Price Search feature (for our Contributing Members) has been updated to reflect January 2013 retail pricing for the US. We try to update this on a monthly basis as the price lists come available to us.For January 2013 the parts price list supports:US: 338,711 partsThanks again to Contributing Member Porschelibrarian! The Retail Parts Price Search feature (for our Contributing Members) has been updated to reflect February 2014 retail pricing for the US. We try to update this on a monthly basis as the price lists come available to us. For February 2014 the parts price list supports: US: 359,942 parts Thanks again to Contributing Member Porschelibrarian for his help in obtaining these lists! The Retail Parts Price Search feature (for our Contributing Members) has been updated to reflect November 2013 retail pricing for the US. We try to update this on a monthly basis as the price lists come available to us. For November 2013 the parts price list supports: US: 353,469 parts Thanks again to Contributing Member Porschelibrarian for his help in obtaining these lists! Hi everybody, So Porsche has a library of catalogs which contains several documents with all the part numbers for many cars up until (approximately) 2010. 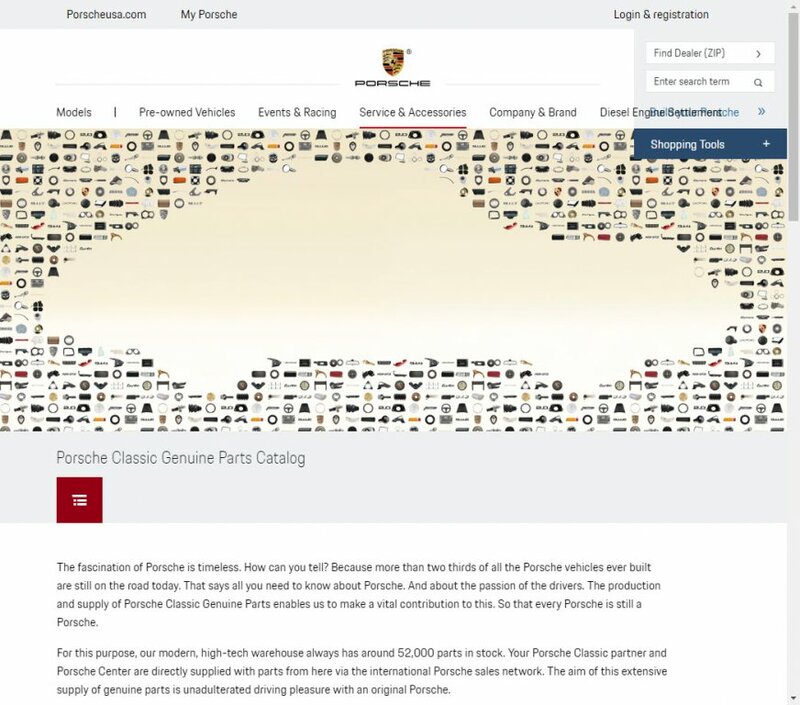 This library can be found on the service area of all Porsche regional sites, for example (US): http://www.porsche.com/usa/accessoriesandservices/porscheservice/originalparts/originalpartscatalogue/ This is a very nice resource for locating parts that need to be replaced in our vehicles. However we are left out of luck for the newer generations. Does anyone have or can point to the newer catalogs? Thanks!! The Retail Parts Price Search feature (for our Contributing Members) has been updated to reflect April 2013 retail pricing for the US. We try to update this on a monthly basis as the price lists come available to us.For April 2013 the parts price list supports:US: 342,064 partsThanks again to Contributing Member Porschelibrarian! The Retail Parts Price Search feature (for our Contributing Members) has been updated to reflect December 2012 retail pricing for the US. We try to update this on a monthly basis as the price lists come available to us. For December 2012 the parts price list supports: US: 324,596 parts Thanks again to Contributing Member Porschelibrarian! Sorry, for being so late with this... The Retail Parts Price Search feature (for our Contributing Members) has been updated to reflect November 2012 retail pricing for the US. We try to update this on a monthly basis as the price lists come available to us. For November 2012 the parts price list supports: US: 336,807 parts Please re-read the Notes at the top of the page as the search format has changed in November 2011. Thanks again to Contributing Member Porschelibrarian! The Retail Parts Price Search feature (for our Contributing Members) has been updated to reflect September 2012 retail pricing for the US. We try to update this on a monthly basis as the price lists come available to us. For September 2012 the parts price list supports: US: 333,396 parts Please re-read the Notes at the top of the page as the search format has changed in November 2011. Thanks again to Contributing Member Porschelibrarian! The Retail Parts Price Search feature (for our Contributing Members) has been updated to reflect August 2012 retail pricing for the US. We try to update this on a monthly basis as the price lists come available to us. For August 2012 the parts price list supports: US: 331,012 parts Please re-read the Notes at the top of the page as the search format has changed in November 2011. Thanks again to Contributing Member Porschelibrarian! The Retail Parts Price Search feature (for our Contributing Members) has been updated to reflect March 2012 retail pricing for the US. We try to update this on a monthly basis as the price lists come available to us. For March 2012 the parts price list supports: US: 324,596 parts Please re-read the Notes at the top of the page as the search format has changed in November 2011. Thanks again to Contributing Member Porschelibrarian! The Retail Parts Price Search feature (for our Contributing Members) has been updated to reflect January 2012 retail pricing for the US. We try to update this on a monthly basis as the price lists come available to us. For January 2012 the parts price list supports: US: 322,216 parts Please re-read the Notes at the top of the page as the search format has changed in November 2011. Thanks again to Contributing Member Porschelibrarian! The Retail Parts Price Search feature (for our Contributing Members) has been updated to reflect December 2011 retail pricing for the US. We try to update this on a monthly basis as the price lists come available to us. For December 2011 the parts price list supports: US: 321,304 parts Please re-read the Notes at the top of the page as the search format has changed in November. Thanks again to Contributing Member Porschelibrarian!